Despite the compact footprint as only 350 mm width by 420 mm depth, the 2420 is designed to meet easy-to-use concept. Three channel memory settings make routine work easy and simple. Further more, the 2420 is equipped with brush-less motor so that the user is free from taking care of the carbon brush. Two types of swinging bucket rotor. The 2420 is able to accept two types of swinging bucket rotor to meet various diagnostic applications. For example, the RS-240 accepts 24 x 15mL glass tubes at 4,000 rpm. On the other hand, the RS-1004 rotor accepts a sealing caps to prevent any contamination from occurring. Many researchers want to use microtiter plate centrifugation allowing a large number of samples to be centrifuged using less energy and in less time. 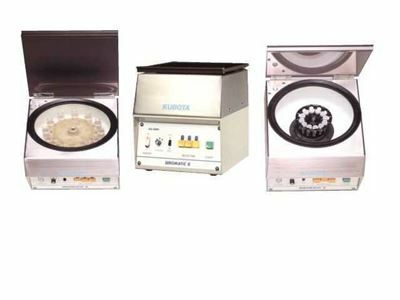 The 2420 can use the RMP-23 rotor, for centrifugation of 6 x microtiter plate at 1,790xg.